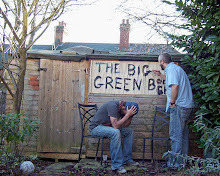 Christmas is coming early to the Big Green Bookshop. Read on for 3 for 2 opportunities and news of the mighty Bookshop Marathon! Over the next five days, we invite you to come along to the shop and pick up the perfect gift for the festive season. Ding dong merrily on high..etc. Yes, yes, we know it's September, but to be totally honest, we need to pay our rent next week and due to having £10,000 owed to us in outstanding invoices, it's gonna be a exciting tale of bookselling derring-do over the next few days in order to do so. So, how can we tempt you into the shop? Well, apart from all the delights we have here already (including a whole new batch of books and toys from Tuffet's), we have three exciting events for you over the next three days. 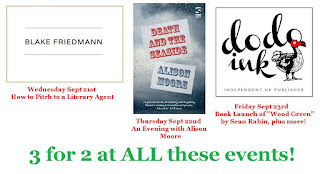 Wednesday September 21st – 7.00pm sharp! With Hattie Grunewald from Blake Friedmann Agency. An amazing opportunity for budding authors to learn some vital lessons on how to approach an agent when you’re pitching your book to them. 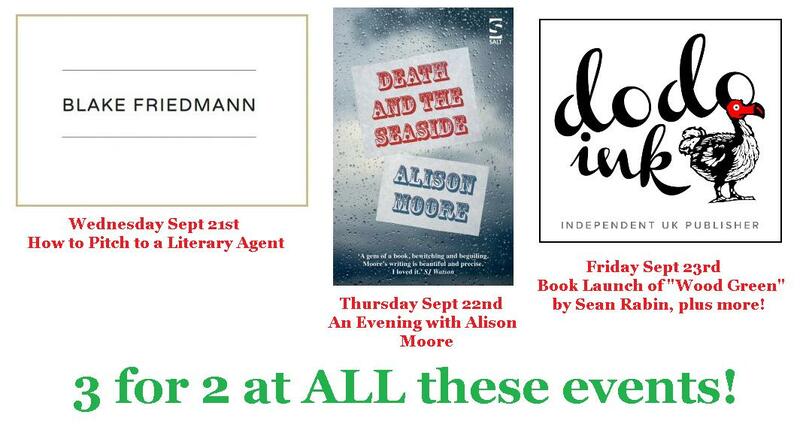 It’s with enormous pleasure that we welcome back Booker shortlisted novelist Alison Moore to the shop to mark the publication of her phenomenal new novel Death and the Seaside. The Launch of "Wood Green" by Sean Rabin. A Celebration of new Indie Publisher Dodo Ink, with Sean, Seraphina Madsen and Tom Tomaszewski! 3 FOR 2 ON ANY BOOKS OR TOYS WE HAVE IN THE SHOP! Tim has declared that on Friday, he will keep the shop open until we take £1000! This can be over the counter, on the phone,or online sales and he will be taking his sleeping bag in on Friday morning. The last time we took £1000 on a Friday was December last year, so I think maybe the egg nog has gone to Tim's head. So what better reason to buy your books here on Wednesday, Thursday and Saturday! (mwa ha ha haa). We'll be announcing more exciting offers nearer the weekend, so look out for that. Game đánh bài đổi thưởng uy tín số 1 Việt Nam. Hỗ trợ đa nền tảng Web, android, iOS. Nhiều event giá trị lớn tri ân game thủ. Keep deals is one of the leading Internet Shopping Sites USA, which provides an amazing collection of different daily life products for you. The store offer Laptops & computers, Camera accessories, Tablets accessories, Mobile and much more. Nice blog, it provides many informative and helpful articles. Thanks for sharing the information. Looking for more updates in the future. - Màu tương khắc: Đỏ, Hồng, Tím. - Màu tương khắc: Trắng, Bạc, Vàng nhạt. - Màu tương khắc: Vàng sậm, Nâu đất. - Màu tương khắc: Đen, Xanh nước biển. - Màu tương khắc: Xanh lá cây, Gỗ. Cảm ơn bạn đã quan tâm đến bài viết của chúng tôi! Phong Thủy Đỗ Huệ chúc các bạn có sự lựa chọn hoàn hảo và chính xác nhất khi đến với Đá. Great, thank you for this informative post. Good job..Thanks for sharing the useful information. A 3 Hour Half Price Sale. Come on!